Who is Henry Wentworth Powys' heir? Henry changed his surname from Feilding to Powys. This name change was accompanied by an ornate document. This document has survived him and is looking for its owner, who is whoever is his current heir. 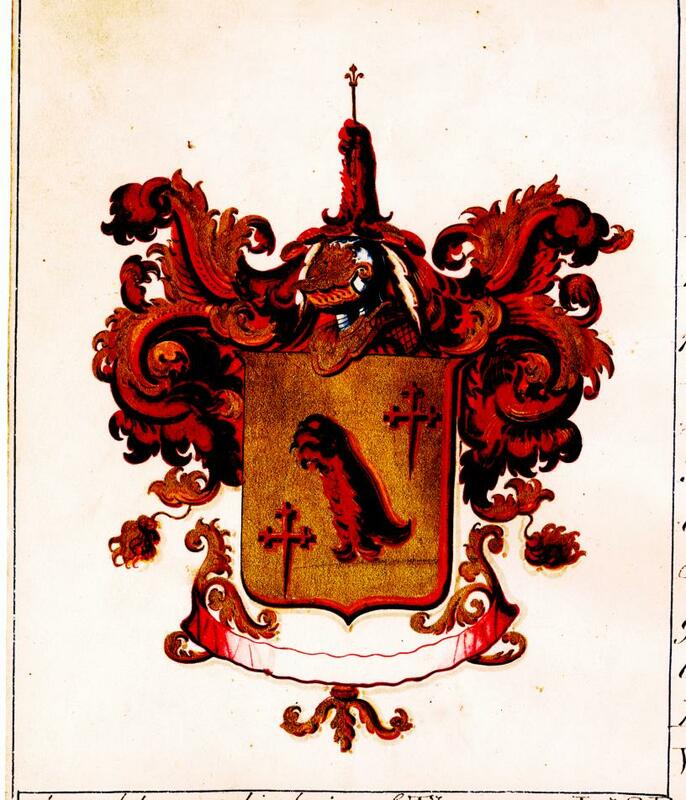 A very reduced copy of his arms from this document is above, a larger, zipped file is right here. In addition there is a copy of the London Gazette of Tuesday August 7th 1832 that announced the change of name by royal licence. Henry Wentworth Powys, who lived from 1798 to 1875, was my sixth cousin five times removed. He had inherited the Berwick estates belonging to one branch of the Powys family. This estate had been purchased by a Thomas Powys who lived from 1679 to 1744. Henry was Thomas' great-great-grandson and inherited them when the male Powyses of that line died out. In order to preserve the family name, and as a condition of his inheritance, he changed his name from Fielding to Powys. But he never married so the name died again. I do not know who his heirs were, let alone the heir to his residual estate. I certainly do not know who his current heir or representative is. His father was Major General William Robert Feilding, Viscount Fielding, though that was a courtesy title as he was the eldest son of the earl of Denbigh and died before his father. The earldom was inherited by Henry's eldest brother William Basil, and continues to this day. Our common ancestor was William Powys of Ludlow who lived from 1494 to 1577 and is the earliest Powys for whom certain knowledge is to be found. He married twice; details are known only of his descendants of his second marriage; of this marriage our family is descended from the second son of the second marriage and the Berwick Powyses from the fourth son of the same marriage, John. William Powys was a farmer with not a vast amount of land and was prominent in the affairs of Ludlow in Shropshire. There would not have been much for the Berwick Powyses to inherit so their steadily increasing prosperity over the next two hundred years must be to their credit. The Berwick Powyses were the only male Powyses to remain and prosper in the Shropshire locality of their forefathers. I hope to find out more of these Powyses as time goes by - and to add to this account. But if anyone knows who is Henry Wentworth Powys's heir, please get in touch and claim the prize! And we should then be able to add to the story of the Berwick Powyses.